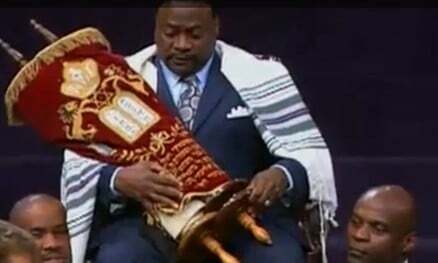 Late last year, following several accusations of child molestation and his wife Vanessa’s petition for divorce, Bishop Eddie Long took a leave of absence from Lithonia, Georgia’s New Birth Missionary Baptist Church. Clearly, Bishop Long just couldn’t stay out of the limelight, as this past week he ended his sabbatical with a highly unorthodox (and some may say sacrilegious) “royal” service on January 29, 2012. As I watched this video, I couldn’t help but give it a major side eye, and question the sanity of the parishioners of the New Birth Missionary Baptist Church. As Rabbi Messer proclaims, “he’s [Bishop Long] a king. God’s blessed him. He’s a humble man. But in him is kingship. In him is royalty,” the parishioners look on in worship and awe. Have the churchgoers of New Birth Missionary Baptist Church forgiven Bishop Long too soon after last year’s allegations (which were settled out of court)? And has the Black church gone too far in placing it’s leaders on a pedestal, to the point where they now consider themselves “kings”? Honestly, it makes my sick.